Scalloping! The idea of searching in crystal clear water for these decadent morsels had me intrigued. So, of course, we planned a trip with 12 of our closest friends. 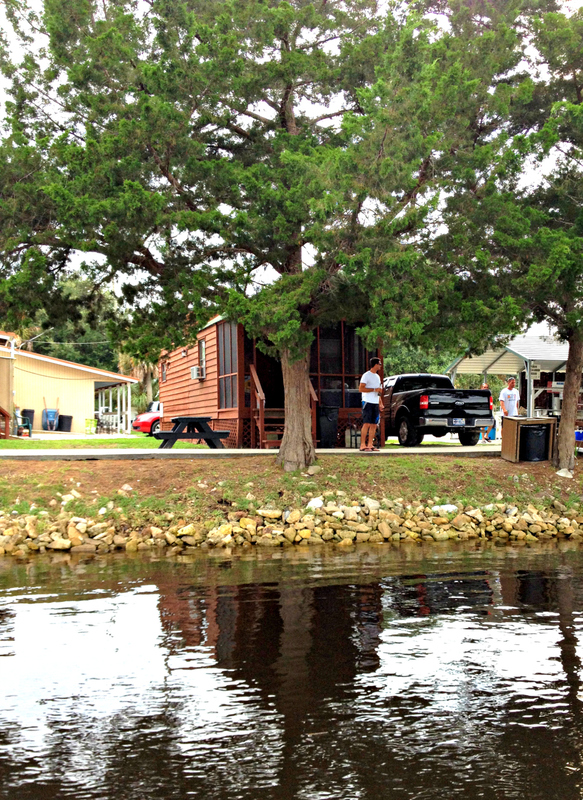 We spent the weekend in a cute little cabin that fit six comfortably at Good Times Motel & Marina in Steinhatchee, Florida (for a price you can't beat either!) Location was important, and it was right next to Who Dat Bar. Now, you know I was on the microphone for some classics, Celine Dion's "It's All Coming Back to Me Now" and Sia's "Titanium", during karaoke night. I had the crowd in their seats and in tears. How does one scallop? Well, we went ten miles out on the boat and scoped out places that were previously marked on our GPS by some veterans. Snorkeling in three to four feet of water, you will find them attached to the top of sea grass or on the bottom of the gulf. It is like a treasure hunt. You just want to find more! These mollusks don't move fast, so once you find one, you are golden. Within seven hours of day one, we almost reached our maximum of 10 gallons of scallops per boat. We baked them that night for our friends. YUM! They cooked quickly, only requiring 10 minutes in the oven with a little butter and some spices. On to day two! Look at its blue eyes! It is supposedly lucky to find an orange scallop. They are dark on one side and light on the other. After a half day on the boat, we went home with our cooler and hearts full of content. I needed a good recipe, and Bay Scallop Recipes on Huff Post Taste caught my eye. I wanted to amplify the texture and sweetness of the scallops. I am a fan of anything doused with lemon and lime juice, and when I saw this recipe, I knew we had to make ceviche with our fresh scallops. It was my first time having ceviche with scallops, since I have only made it with fish and shrimp. Rinse and clean scallops. In a large mixing bowl combine lime juice, lemon juice, sugar, garlic, salt and pepper. Add pepper, onion, and tomato to the marinade. Add scallops and gently stir. Cover with plastic wrap (press plastic wrap down onto the mixture, so there is no air in between) and place in the refrigerator for 1-2 hours. Meanwhile, prepare tortilla crisps. Cut tortillas into quarters. Brush with olive oil and place on a sheet tray (you will have to use 2 sheet trays for the entire recipe). Season lightly with salt and bake in a pre-heated 375 degree oven for 12 minutes. Allow to cool so they become nice and crispy. Strain off most of the liquid and pour ceviche into a another bowl. Drizzle with a little olive oil and mix in chopped cilantro. Taste and season with more salt and pepper, if required. If you like ceviche, you have to give Scallop Ceviche a try! Too good! Whoa, buddy! Since it was later in the season, we got some good-sized scallops. 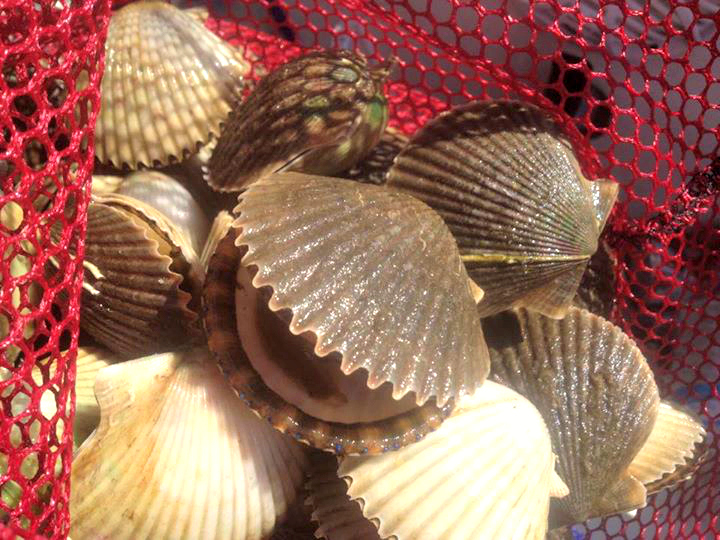 If you want to go scalloping, September 24th is the last day to go.